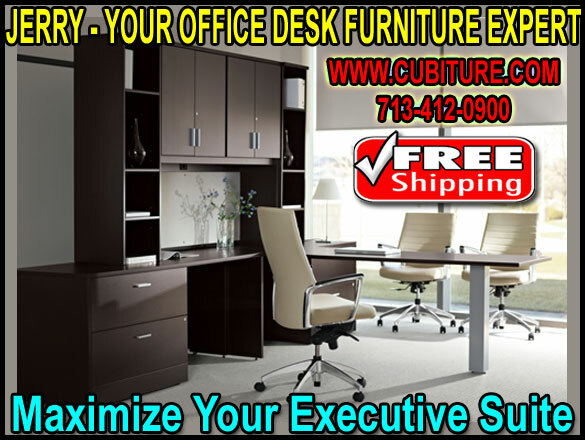 Office desk furniture is found in every office and every cubicle system. An exhaustive treatment of the topic would take many volumes to explore. The purpose of today’s blog is a bit more focused. Rather than trying to describe office desks from the perspective of near infinite diversity, we want to focus instead on two popular types of office furniture desks that help make Cubiture the preferred choice for so many Houston businesses. Those of you who have worked from home know how important it is to separate your work area from your surrounding home environment. Without this separation, both discipline and emotional stamina quickly begin to deteriorate. You begin to feel like work is something that you can never get away from, and you take too many breaks if you are working in the very same space where your pursue entertainment. Jerry can remedy this situation with a desking system that provides you with a focused work environment that will increase your productivity. Such an environment can fit into even the smallest of bedrooms or apartment living rooms. Desks that curve around to either side of you keep everything within easy reach without consuming that much physical space within a room. Filing and storage systems integrated into the desk can keep all of your vital supplies and equipment in one compact, highly efficient workspace that clearly separates your work life from your personal life. The medical staff is constantly multitasking. They need specialized desking systems that will allow them to operate phones, multiple electronic media, and confidential patient records. Jerry’s knowledge of space planning, combined with his experience in high-density filing and storage, has enabled him to design some of the most unique medical reception centers in the industry. These desks are characterized by exceptional ergonomics and filing and storage areas that are fully compliant with HIIPA regulations. These desks keep data within easy reach of authorized personnel but also conceal displays and hard copy from open view. These desking systems are not something you can just order from a catalog or find on some point-and-click, megalithic online store. These desks are custom designed by our owner and founder, Jerry Mogyorody. They are built right here in our Houston factory, and they are sold directly to local businesses without the markup of third party middle men or freight carriers. Call Jerry today, and start with a free office walkthrough and space plan layout drawing.